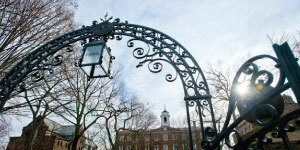 Rutgers, The State University of New Jersey, is a leading international research institution. Chartered in 1766, Rutgers is the eighth-oldest institution for higher learning in North America, with universities in New Brunswick, Newark, and Camden and a Health Sciences Division with locations across the state of New Jersey. Rutgers–New Brunswick is the state’s most comprehensive intellectual resource and the flagship campus of Rutgers, as designated by the Association of American Universities (AAU). Rutgers–New Brunswick is the largest and most residential university within the Rutgers system. It offers more than 100 undergraduate programs of study and includes five campuses with a variety of settings. Students enjoy state-of-the-art classrooms and laboratories, six vibrant student centers, four dining halls, and ultramodern recreation facilities—all in addition to a college town with boutiques, shops, four-star restaurants, comedy and music clubs, and three theaters. Rutgers is a public research university with groundbreaking projects in areas as diverse as stem cell research and oceanography. 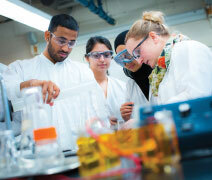 Rutgers students have the opportunity to be part of a dynamic science and engineering community. With more than 175 research centers and a focus on hands-on research, students work alongside world-renowned faculty, solving societal problems locally and globally. Students thrive from experiential learning programs in 40+ science majors, from Environmental Science to Engineering, giving them the skills needed to succeed. Additionally, in today’s competitive workforce, employers are looking for well-rounded professionals. Rutgers offers a unique approach to student growth by enabling students to pair science and the humanities in order to develop a complete skill set. 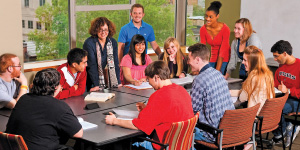 With dual degrees from the School of Arts and Sciences and Rutgers Business School, students can create an individualized academic experience that not only provides the science and engineering knowledge needed to compete for top jobs but the communication and writing skills employers seek in top candidates. Rutgers is considered the preeminent destination for aspiring health professionals, ranked #2 in the nation for “Best Colleges to Study Health Professions” (College Factual). Many Rutgers students pursue Pre-medicine or Pre-dentistry advising tracks. The medical school acceptance rate is 56% for Rutgers graduates, which is higher than the 41% national average. The Rutgers Health Professions Office advises students interested in health-related fields, providing exclusive workshops, internships, and job shadowing experiences at leading medical facilities within walking distance of campus. For more than 150 years, the School of Engineering has prepared students for successful careers through rigorous course work supported by groundbreaking research opportunities and leadership development. At the #1 “Public University for Undergraduate Engineering” in New Jersey (ranked by U.S. News & World Report), our students tackle issues of global importance, such as infrastructure sustainability, cybersecurity, and spacecraft design, under the direction of distinguished faculty in state-of-the-art facilities. Faculty include those honored by the National Science Foundation and the National Academy of Engineering, as well as the professional societies of each of the engineering disciplines. Internships and cooperative programs are an important part of a Rutgers engineering education, preparing students with real-world experience in leading corporate, industrial, research, and government settings across the country and internationally. Students have most recently secured internship opportunities at Boeing, Tesla, L’Oreal, Bell Helicopter, Goldman Sachs, Johnson & Johnson, NASA, MIT, and the Food and Drug Administration. Covering the biological spectrum from molecules to ecosystems, the diverse majors offered through the School of Environmental and Biological Sciences provide excellent preparation for professional school (medical, dental, veterinary medicine, and law), graduate study, and positions in government, industry, business, and health-related areas. From devising environmentally friendly pest management strategies to mapping sea level change using unmanned submersible gliders, our students pursue research projects, internships, and service learning opportunities—all of which are hallmarks of an education at one of the top public research universities in the nation. Students also have access to a robust program of applied research and outreach hosted by the New Jersey Agricultural Experiment Station laboratories with farms, business incubators, and marine stations throughout the state. Research accomplishments include development of the antibiotic streptomycin, the cure for tuberculosis and winner of the Nobel Prize; pioneering work in mosquito control; and new tools to combat obesity. Rutgers–New Brunswick’s prime location between New York City and Philadelphia provides you with access to thousands of employers and internships and the world’s best art and entertainment. In an hour or less by train or car, you can find yourself commuting to the city for your first internship or cooperative program followed by a night applauding a Broadway performance or viewing the Liberty Bell in Philadelphia. The city of New Brunswick is also a cultural hot spot with museums, theaters, art installations, a comedy club, and film festivals. Let’s not forget about the picturesque Jersey Shore and mountains—New Jersey has it all. Career counseling, learning resource centers, health services, academic advising, undergraduate research, and leadership training are just a small sampling of services available to students. In fact, Rutgers hosts dozens of job and internship fairs and is a preferred recruitment site for more than 650 corporate, nonprofit, and government employers who visit Rutgers each year. Rutgers’s Career Services office, one of the largest and most comprehensive in the United States, sponsors internship fairs every year. With one-on-one résumé reviews and interview training, Rutgers students graduate with a competitive edge in the global marketplace. With more than 600 student groups to choose from, including Rutgers Formula Racing, the Society of Women Engineers, more than 25 student-led engineering groups, and more than 80 fraternities and sororities, Rutgers students can get involved in activities that range from community service to almost every variety of social, cultural, and athletic club. Rutgers students also donate thousands of hours each year to service projects such as Dance Marathon, Recyclemania, and Scarlet Day of Service. Study abroad options are also available to study in more than 50 countries, such as the Technical University Munich in Germany and Pohang University of Science and Technology in South Korea. As a member of the NCAA Division I Big Ten Conference with 24 competitive men’s and women’s sports teams, the Scarlet Knights provide thrills and excitement, drawing crowds from the Rutgers–New Brunswick community and the greater New Jersey/New York/Philadelphia region. Students who wish to prioritize their academics and still compete in intercollegiate athletics can choose from nearly 50 student-run sport clubs, including a nationally ranked cricket club and a highlycompetitive ice hockey team. Extensive recreational facilities on all residential campuses make it easy for students to stay fit and have fun. Residence Life serves the largest on-campus student population in the country: currently more than 16,000 residents. Housing options include small houses, apartments, suites, and large residence halls in a variety of settings, including a plaza with a first-run movie theater and a classic New Jersey diner! Students can even choose special-interest living-learning communities such as Engineering and Women in Engineering.